← Thisismytheatre Perform “The Importance of Being Earnest” – 16th Aug 7pm. Open Sunday​ with tours and refreshments available. Or just pop in for a chat. Reflective music and a warm welcome to all. Remember them. ​We invite all to attend including ex-services men and women too. 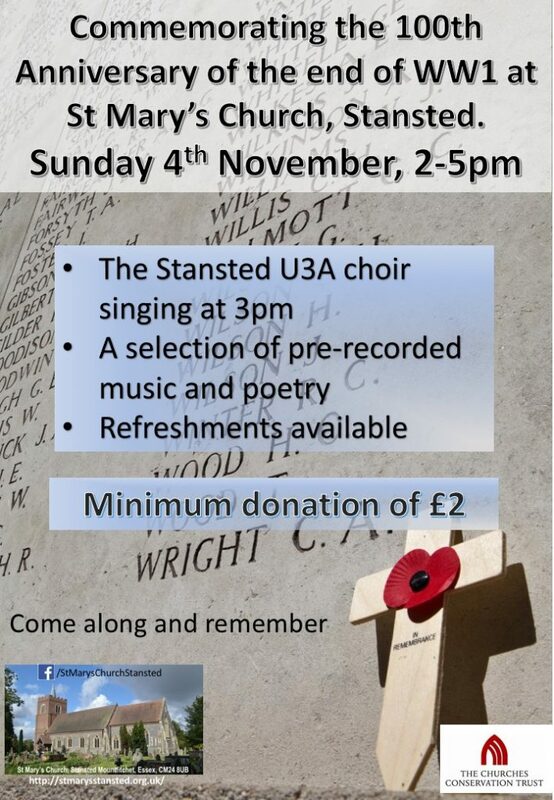 The U3A choir will be singing a selection of tunes at 3pm. WW1 pre recorded music and poetry to mark the anniversary of the end of the war. £2.00 minimum donation. Refreshments available. This entry was posted in Events and tagged CCT, events, November, October, StMary's Stansted. Bookmark the permalink.